The 14th International Conference on Thalassaemia and Other Haemoglobinopathies & the 16th TIF Conference for Patients and Parents constitute the largest biennial educational event of Thalassaemia International Federation (TIF). Organized in collaboration with the Greek Thalassaemia Federation (EOTHA), with the support of the Greek Thalassaemia Association (ESTHA) and the Hellenic Society of Haematology, the Conference took place on 17-19 November 2017. This special issue would like to be a tribute to Renzo Galanello and Antonio Cao, two very important figures in the fields of Pediatrics, Hematology and Thalassemia. With their studies, they have contributed to the growth of the whole scientific community, to the understanding of the pathophysiology and molecular basis of hemoglobinopathies and to the improvement of therapeutic interventions. Antonio Cao, an excellent clinician and an extremely curious scientist, has contributed to design various programs of population screening, genetic counseling and prenatal diagnosis that led to the substantial eradication of β-thalassemia in Sardinia, the land he was born in and loved so much. Renzo Galanello has been a leading scientist in the clinical validation of novel oral chelators and the diagnostic assessment of cardiac iron overload by nuclear magnetic resonance. 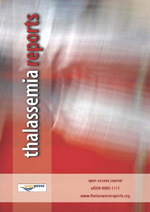 Their studies provided a considerable contribution in promoting the survival, general health and quality of life of the β-thalassemia patients worldwide. They both were members of national and international scientific associations, of editorial committees of hematology journals and scientific advisors of the Thalassemia International Federation. Their careers were signed by countless honors and prizes. The several publications on their behalf continue to give starting points for the development of new lines of research. For all these reasons, Antonio and Renzo are still among us and will be forever until we will be able to understand the actuality of the teachings contained in their studies and make good use for years to come.